In every hall of the National Archaeological Museum in Athens there are exhibits that could escape the visitor’s attention, “hidden” as they are in the abundance of the museum’s collections. Sometimes we need to take a closer look so that the beauty, the charm and the significance an artefact had in the society and the culture of its time is being revealed. The National Archaeological Museum, aiming to strengthen its ties to the public turns the spotlight on exhibits of Prehistoric and Historic times which had never been given the appropriate attention. The following text is based on a presentation by NAM archaeologist of the Prehistoric, Egyptian, Cypriot and Eastern Antiquities’ Collections, Katerina Kostanti. 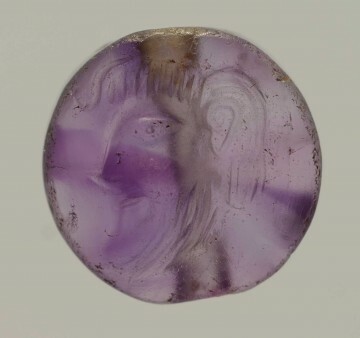 The presented artefact is a seal stone made of amethyst featuring a male figure. The artefact was found in Grave C of the Grave Circle B of Mycenae (Mycenaean Antiquities exhibition, Room 4, display case M16, NAM 8708). On this minuscule amethyst disc-shaped seal (measuring 9mm in diameter), a gifted and experienced Minoan craftsman has depicted a lively, exquisitely detailed and unprecedentedly artistic representation of a male head in profile. The man has a beard, fluffy hair with a characteristic lock over the forehead and his mouth is open. A transparent hole permitted the object’s use as a neck or arm pendant. The object was found alongside precious weapons, pots and a funerary mask made of electrum (a gold and silver alloy) within the burial of a 30-35 year-old man from the first generation of the Mycenaean Lords. Although it is impossible to talk about “prosopography” in the sense of depicting the characteristics of a specific person, the human head in profile is so rare as a theme that the making of this seal would have been commissioned.